By Mustaza Mustafa in Internet. Updated on November 10, 2017 . Ebooks allow us to organize our collections of reading materials, and making it easier than ever to distribute to friends and readers with similar interests. There are some of us who like to curate contents from several sites down to one source that we can access even without an Internet connection. However, there are limited options for converting reading materials to an ebook format, especially from websites and blogs. The standard way is by spending time to copy and paste content to MS Word, or Pages on Mac, where you can save the file as PDF, or in the standard ePub format. 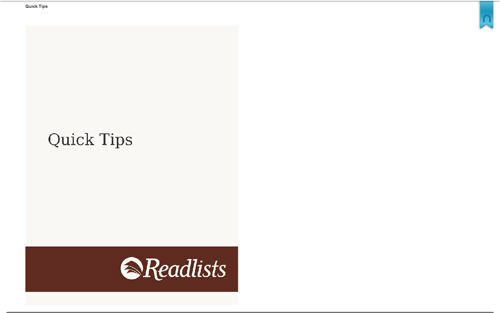 This is quite a hassle considering the time needed to complete the process, and that is why we’d suggest you try the alternative: a web application called Readlist. Now to start converting web articles into ebook format, go to the Readlist official site and click on the button Make a Readlist at the top right corner of the page. You will be redirected to the content curation page. 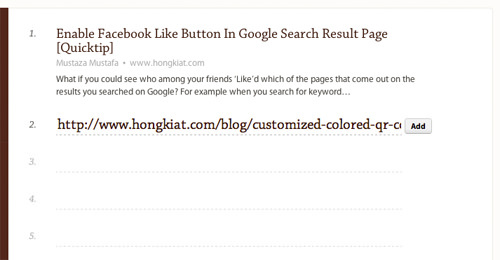 What you need to do here is to copy the link to the article and paste it in the curation page. Click Add. 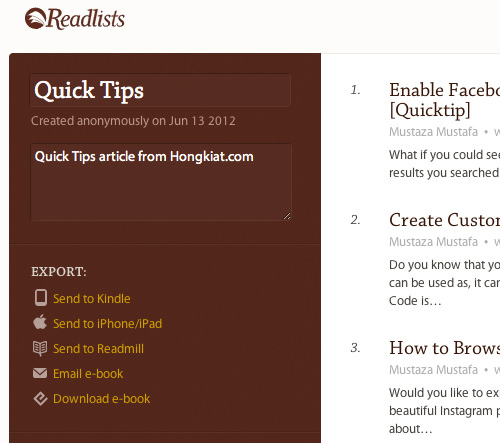 Readlist will crawl over the contents like the author, title and the website and the content. After completing your curation process, look at the left sidebar and add a name to your list, a description and then select the option to send it directly to your Kindle, iPhone/iPad or Readmill. You can also email the list or directly download the ebook in ePub format. There is no registration required. If you select to send the ebook to your iPhone or iPad, click on the Send to iPhone/iPad option, fill up your email address and click the Send button. Then open your email from your iOS devices to download the ebook, it’s that easy! In my case, I prefer to download the ebook directly to my Mac, and open it with my Nook for Mac ebook application.This is what I get. And this is what the contents of the ebook looks like. It’s so easy to produce an ebook now even if you aren’t a publisher. When your ebook is completed, you can download it for personal safekeeping, or share it with your friends and folks who share the same interests with you. If they like to read what you curate, you may even get subscribers to your curation list. 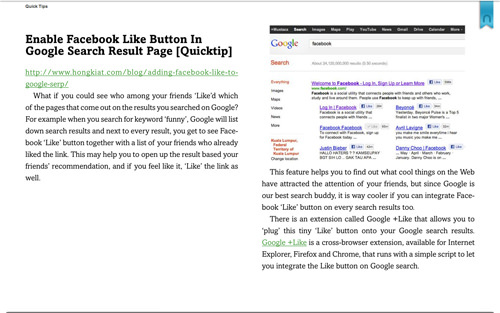 By the way, check out this link to find out how you can read an ePub ebook directly from your browser. So start curating!